This weekend I attempted my first "Pinterest" project. I freaking love that site! Now I can bookmark all the fun stuff I find on the internet. It's all neat and tidy in it's little "boards", which totally fits my personality. AND the kids can't even come along and mess it up! It's great! So as you all know I'm throwing my sister in law a baby shower. 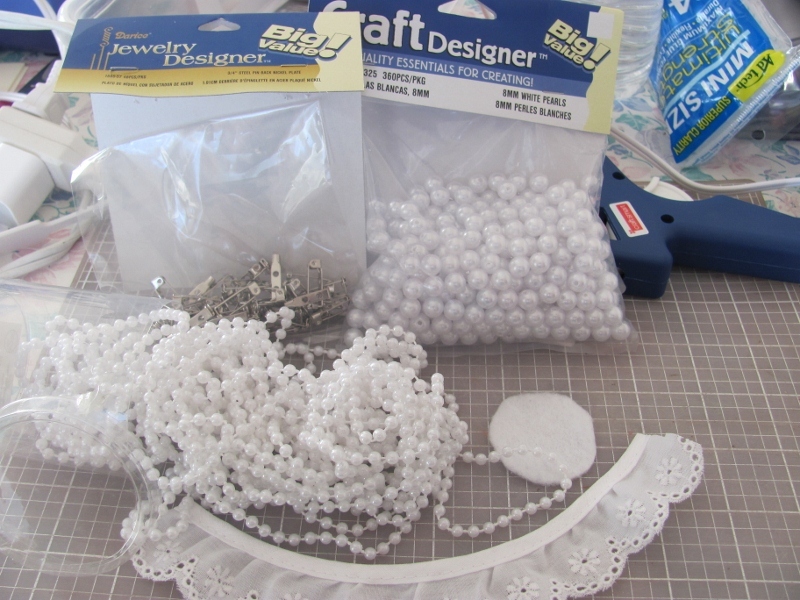 The theme is pearls and lace. So pretty much anything I see that slightly fits in that category and be cute for the shower I "pin". Last week I came across this cute blog, My Girlish Whims. She has a lot of cute projects and tutorials on her site. I found this adorable hair pin, which just happens to have PEARLS AND LACE! 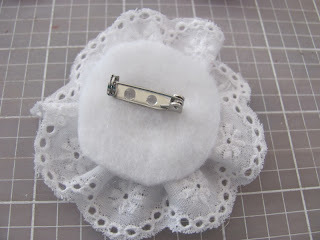 My plan was to turn them into little pins to be corsage/party favors for the shower. Yeah obviously it went a different direction! I just couldn't get them to look right the original way. After making two that just didn't seem to be the right shape (and now that I look back her lace was flat while mine was gathered). 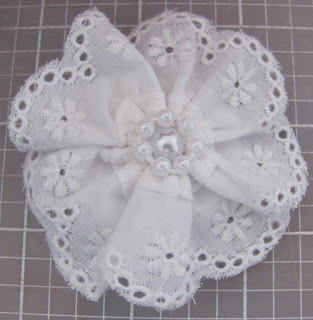 I started messing around with the lace and decided I might like them better if I gathered the lace up and made a flower. So that's what I did. I took a bunch of pictures along the way if anyone is interested in knowing how I made it. I ended up making over twenty of them before I ran out of lace. I went today and bought what was left. Hopefully they'll restock or I'll just have to hit a different Joann's if I need to make anymore. I think I might have enough after this round though. Those hair pins are great - so cute!!! I can't wait to see how everything else for the shower turns out. And Pinterest rocks - I absolutely love it. My husband is finally on board considering I've tried like five recipes now from Pinterest and he's all about me making new things. (o: And my house is currently under construction thanks to all of my new decorating ideas. I think your ones look fantastic! I have a pinterest addiction and have started a pinterest project challenge for myself. I'm bookmarking this! Every once and awhile I feature people who have used my tutorials, so next time I do I'll put your project on it! !